ST. LOUIS – J.D. 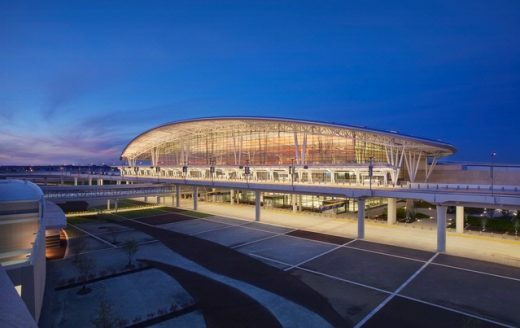 Power and Associates has given the HOK-designed Col. H. Weir Cook Terminal at Indianapolis International Airport its highest marks in passenger satisfaction in a survey of 64 major airports. The $1.2 billion terminal earned 777 points – the most of any airport surveyed – in airport accessibility, baggage claim, check-in and baggage check-in process, terminal facilities, ease of security checks, and food and retail services. 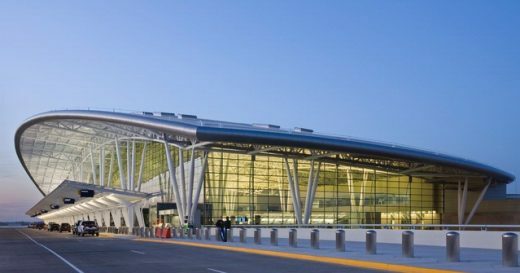 The terminal, which debuted in 2008, was the first designed with new security protocols following the 9/11 terrorist attacks.”We found that Indianapolis ranked highest in both the small category of airports with fewer than 10 million passengers a year and also highest overall in the entire study. And that’s up from a tie for 13th in the previous study two years ago,” said Stuart Greif, vice president and general manager of global hospitality for J.D. Power in an interview with the Indianapolis Star Tribune. 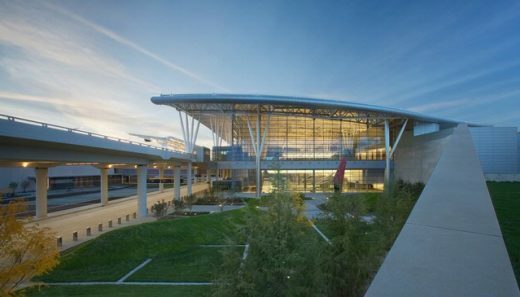 In August of 2001, HOK won the contract to design the new $1.2 billion Indianapolis International Airport. A month later, its assignment grew far more complicated when the world of air travel changed forever with the September 11th terrorist attacks. Not only was HOK charged with designing an airport that was to be a civic asset, but that design needed to conform to radical changes in security protocols. The Colonel H. Weir Cook Terminal, a 1.2 million-square-foot facility, combines pre-9/11 comfort and convenience with post-9/11 security mandates. 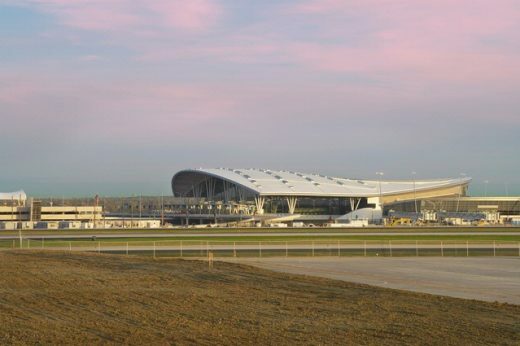 The design acknowledges that in a global economy international airports are often the traveller’s first and last impression of a metropolitan area. As befits Indianapolis’ “Circle City” moniker, the terminal’s focal point is a 30,000-square-foot piazza – a circular civic plaza beneath a 200-foot diameter skylight with sunshades. Its five-storey high windows offer panoramic views of Indianapolis and the surrounding areas connecting travellers to the city, whilst the large open space within the piazza will be used to showcase the city’s culture and host iconic events, significant conventions and political gatherings. Building on computer modelling that simulates the movement of passengers, the design for the terminal mitigates the ‘need to rush’ anxiety that has surfaced with the advent of elevated security measures. Separate passenger and airport employee security check points and a larger passenger check point will improve flow and cut waiting time. Advanced screening technology reduces the need to open hand baggage, whilst for checked luggage a three-stage approach consisting of high-tech screening, manual inspections and more thorough inspections of suspicious items in a secured location, will result in faster checks. Security cameras will also monitor every vehicle that enters and exits the airport. 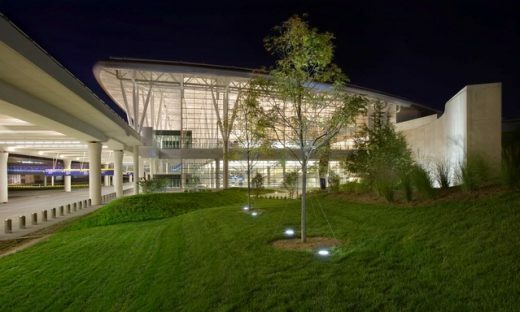 Indianapolis expects to be the largest LEED-certified building in Midwest America and is the first free standing terminal building in the US to offer a highly energy efficient terminal building that is responsive to the environment. The great sheltering roof uses filtered glass to mitigate heat from solar gain whilst allowing light into the terminal to minimize the use of artificial lighting. Discharge from fuel and de-icing are controlled using bio swales populated with plants that consume hydrocarbons and detention ponds encourage the growth of microorganisms that also consume airport discharge. Inside the terminal building a combination of HVAC and floor-imbedded piping chills the floor in summer and warms it in winter. HOK is a global architectural firm that specializes in planning, design and delivery solutions for buildings and communities. Through its collaborative network of 24 offices worldwide, the firm serves diverse clients within the corporate, commercial, public and institutional markets. HOK is committed to developing resources and expertise to help lead the world toward sustainable communities and building environments. Founded in 1955, the firm’s expertise includes architecture, engineering, interiors, planning, lighting, graphics, facilities planning and assessment and construction services.